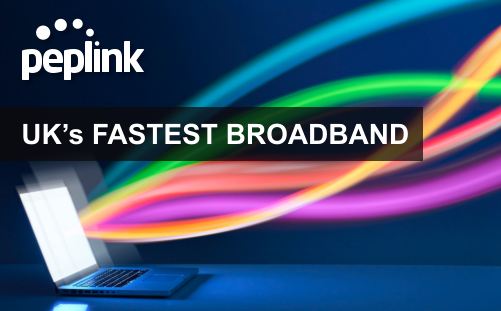 Its a big bold statement I realise, but in my recent test I proved that I could provide Peplink enabled broadband 34 times faster than Virgin Media and 16 times faster than Plusnet. In this article I will explain how. Recently I took on some new office space which will act as a new home for some like minded networking geeks and I to work from here in Exeter. Naturally the first thing I did before I signed the contract was check the advertised broadband speeds for the postcode and I was relieved to discover that Plusnet could offer BT infinity @ 70Mbps and Virginmedia said they could deliver 200Mbps using their fibre product. As you might expect, I wanted to combine both services at the office for provider diversity and to aggregate bandwidth so this seemed like a perfect time to compare and contrast how fast two different providers could install and activate broadband at the new address. I didn’t want to order the broadband until the contract had been signed on the office space, but needed to work from there immediately as I had to measure up for new furniture and do some cosmetic improvements on the kitchen and office (new kitchen sink, units, paint and office carpet). Since I work for Peplink I am luckily enough to have a number of MAX Cellular routers to hand so set one up with an EE sim ready for the next day in the office, and then sat down and ordered broadband services from both Virginmedia and Plusnet. With both orders placed I started a virtual stopwatch and waited to see what would happen next. The following day I turned up on site, unboxed the MAX BR1 with the EE SIM installed and got connected immediately. EE gave me 20MBps down and 8Mbps up at that location – more than enough for day to day work and VoiP. Then I plugged a VoiP handset into the BR1, set up a Wifi SSID for my laptop and used PepVPN to connect back to my home office. I was working productively in the new office within 10mins of arriving on site – with full secure access to my network attached storage at home. For anyone who doesn’t have a MAX router kicking about at home, you can do the same thing yourself by contacting one of our Peplink Partners here in the UK such as Grapevine Connect, who can send you a BR1 in a case via courier for next day self install including a fully provisioned SIM on a network of your choice. The Race Is On – Who Will Be Fastest? It’s worth mentioning at this point that this office has previously had both BT Infinity broadband and Virgin media leased lines installed – so both companies should have been aware of the property and been familiar with existing cable routes and ducting available to get the services from the nearest roadside cabinet into the server room where it was installed before. However their approaches to the installation were very different. 17th March – Engineer arrived, reterminated existing unused copper lines on site to provide service. 4th April – Engineers arrived and installed new cable from a distant roadside enclosure. I would have expected the Credit check issue with the Virginmedia order to have added a day or two of time penalty to the process, but since I ordered it before the Plusnet connection which was processed without issue, it does seem they are a little more risk adverse than Plusnet / BT. Additionally it really annoyed me that I had to repeatedly contact Virgin media for updates whereas Plusnet kept me informed throughout with email updates. Virginmedia allocated me an account manager – a lovely idea, but they became a bottleneck when I called and no one but them were able to update me on the status of the order. Using Peplink hardware and EE LTE cellular data connectivity I was able to get this new office connected in 24hrs – 15 days faster than the next alternative provider in this test. That meant that I could work productively at this site for a whole two weeks more than would’ve been possible without enterprise grade cellular connectivity. Hybrid WAN is the next step in this project as I look to combine the Plusnet and Virginmedia fibre connectivity for resilience and bandwidth aggregation – I’ll be blogging about this next so be sure to subscribe to my blog and follow me on twitter if you want to learn more about that. Did the speeds match the predicted speeds as well? Hi Rory, Yes they did.